Musician Mizter Okyere was a guest at Zylofon FM’s Showbiz Agenda, hosted by Sammy Flex on Friday 4 May, 2018. Mizter Okyere started as a sound engineer in Kumasi and then moved to Accra as a singer. Apart from playing the keyboard and some other instruments, he is best known for playing the saxophone. 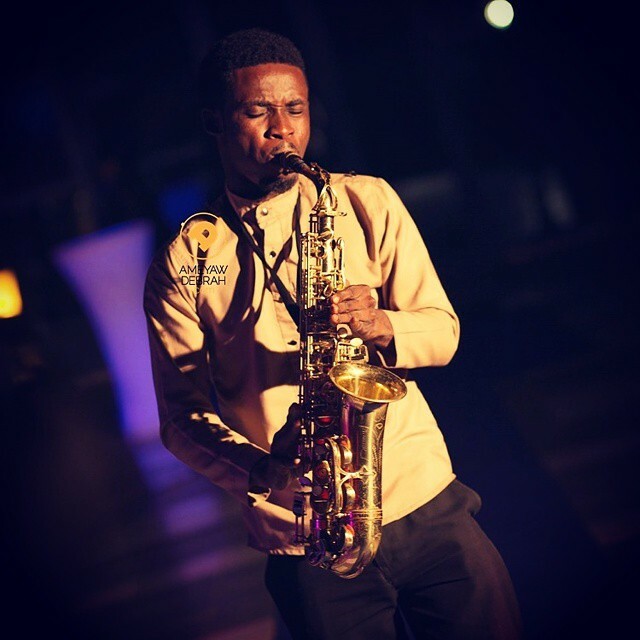 According to Mizter Okyere, he is a self-taught saxophonist, who has been playing it for six years. He has worked with numerous artistes such as Stonebwoy, Shatta Wale, Becca, Efya, Samini, Patoranking, Obrafour and Flowking Stone. Recently, Mizter Okyere performed with Samini at the VGMAs and it was awesome. During the interview, he said that things started to change for him when Patoranking contacted him to to contribute to the music production of the popular song ‘Na Wash’ by Becca ft. Patoranking. He has formed his own band called Mizter Okyere & Family Music Band (MOF Music Band), which consists of four members. He will be releasing his album soon. He disclosed that he sings in five tracks and the rest consists of music with the saxophone.